I paid some real world dollars to be able to watch the Eve Fanfest action over the HD stream. It was actually quite enjoyable on the living room television. When I purchased the HD stream, I quickly clicked through the payment windows and there was some mention about a T-shirt. Silly me, I thought I was getting a neat Quafe T-shirt in the mail in a few weeks. I checked my apartment building’s package room a few times after Fanfest ended in anticipation of the present and what I actually got were some pixels after I logged into my main character’s account. Sure, why not? *click* Now I have some digital T-shirts sitting in my hangar. I suppose that I should hang on to the items since they have gone up in price since they were put in the game. I am however, left wondinering what this means for the furture of Eve. Are we gradually going to accept the new role that these types of items have in the game? 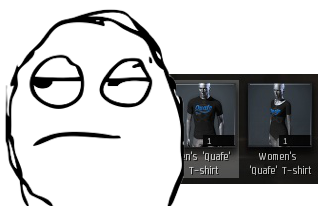 I feel that items like this T-shirt, and especially the free Aurum that was introduced to players via the reward system for uploading content to eveisreal.net, are doing nothing but bringing the Aurum concept into our lexicon. 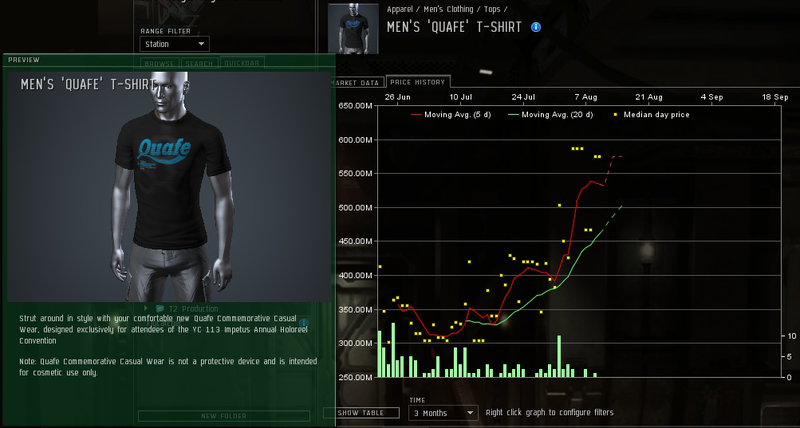 CCP Incarna Project Manager: People are not on board with the new currency! Employee: Um, what if we just start giving it away? Perhaps for doing something easy like uploading some content for us? CCP Incarna Project Manager: Make it go! Suppose the giveaways are simply a strategy to bring the NeX and items normally purchased with Aurum to the forefront — to make them ‘normal’. What’s the problem? New players will think it’s normal and will start giving CCP more money than the bitter vets. Bitter vets will develop some clever term for these players (like ‘Carnations’ or something) and have another irrelevant position to feel superior about. Seems like a win both ways as long as the thin red line isn’t crossed somewhere along the way. In the words of Hannibal (A-Team): I love it when a plan comes together! CCP giveaways often ended up being as useless as a nose attached to your elbow. The shirts are just in line with that, except this time someone actually seems to want them (there is a market). About NEX: Imho most people will just stockpile the free NEX and cash them if conditions are good (“ok, the sunglasses are cool for my brutor, and they are kind of free”, “yay this one sells for 100m/piece”). I’m personally saving mine for the day I can paint my Tengu black.